Data loss can take different forms - accidental deletion, hard drive failure, software bugs, data corruption, hacking, even a simple power failure can cause you to lose data. And, of course, there are more extreme cases, like when a hard drive is recovered from a plane crash. Some data recovery specialists can retrieve data from storage media that’s been almost completely destroyed. Data recovery is a process of salvaging or retrieving inaccessible, lost, corrupted, damaged or formatted data from secondary storage, removable media or files when the data stored in them cannot be accessed in a normal way. The data is most often salvaged from storage media such as internal or external hard disk drives (HDDs), solid-state drives (SSDs), USB flash drives, magnetic tapes, CDs, DVDs, RAID subsystems, and other electronic devices. Data recovery may be required due to physical damage to the storage devices or logical damage to the file system that prevents it from being mounted by the host operating system (OS). 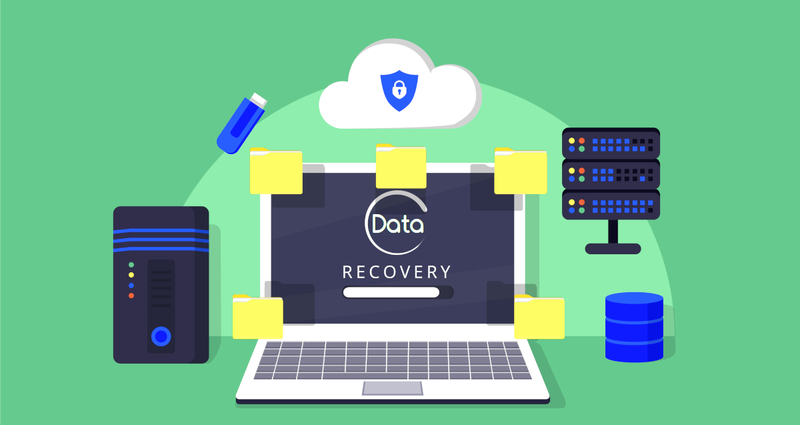 In the IT sector, data recovery typically refers to the restoration of data to a desktop, laptop, server or external storage system from a backup. Why data recovery is important? Data Recovery has become an essential activity for the people in the computer world. The valuable data can get corrupt or lost at any point of time or the partitions might become inaccessible. Data recovery services are very useful and allow you to recover lost information and data in situations where your hard drive or your storage media becomes corrupted. Data might not be able to be accessed for a multitude of reasons: unrecognized format, virus attack, accidental deletion, permanent deletion of files, inaccessible partitions, damaged/corrupted files, unexpected system shutdown, error messages, etc. Data recovery is like fixing broken toys with glue and making them usable again. With the help of data recovery software and services, your lost and inaccessible data can become usable again. What are the data recovery chances? Data recovery is based on the principle that no data disappears until it is overwritten. As each file system sets its own rules of managing data, the chances for successful data recovery depend greatly on the file system your storage is formatted with. The chances of successful data recovery depending on a files system. Your actions immediately after data loss are important as well - if you do anything possible to prevent the storage from further writing, the chances to get a critical file back increase. Is data recovery safe and secure? A data recovery software doesn’t make any modifications to the original data and rather makes a virtual reconstruction of the file system to find the data inside of it. At the same time, when you work with physically damaged hard disk drives, it is recommended to make a disk image to avoid any further data loss and disk failure. What are the types of Data Recovery Systems? There are several different types of data recovery systems that organizations and businesses use to recover data. Before to choose, you must assess all of the critical levels of your data and systems to determine a policy and recovery system that will be well-suited to you. With online disk backup, you can backup your data more frequently which is ideal for data that is constantly changing on a daily basis. An online disk backup service also provides tiered recovery architecture which provides more flexibility and options that require frequent critical data backup and intermittent backup for data that is not as critical. Online disk backup is a time saver as well as a money saver. It is important to note that you should do your homework when choosing an online disk backup service to ensure they are reliable and enforce security policies and regulations. Bare metal recovery involves backing up the entire system including the operating system, software applications, and data. This recovery type allows you to restore the entire operating system in a single procedure which reduces the recovery time by hours. This prevents you from having to reformat everything from scratch by reinstalling the operating system, software applications, and restoring the data and settings. Continuous backup is also known as continuous data protection (CDP). It saves time in the recovery process because it contains a dual purpose method of backing up data. With this process, you can back up data on your local area network onsite while simultaneously backing up the data to an offsite location. If the organization suffers data loss onsite, this process can tap into the offsite data backup system. A continuous data protection backup creates a log of complete storage snapshots as well as any modifications to the data that occur since the last backup. The installation of a continuous data protection system is fairly straightforward and if it contains disk storage, recovery time is almost immediate. Continuous data protection is gaining momentum with a lot of organizations due to its ability to continuously monitor and record all modifications to data and then backing it up both onsite and offsite. You can share you experiences with us the comment section. Thank you!